Some of the UAE’s most promising young artists are exhibiting their work alongside the world’s leading street artists at Dubai Canvas, the public art festival being organised by Brand Dubai, the creative arm of the Government of Dubai Media Office (GDMO). Organised in partnership with Meraas, the fourth edition of Dubai Canvas runs until 7 March 2018 at La Mer. Local artists participating in this year’s Dubai Canvas include Fatma Al Ali, Sara Yaqoub Al Khoori, Asma Al Khoori, Mahra Hamdan Al Falahi and Myneandyours. Fatma Al Ali is a 23-year old multi-disciplinary artist who is currently doing her Bachelor’s degree in Fine Arts and Design in Sharjah. She is interested in drawing in all formats and on every possible surface, be it a street, a wall or simply a piece of paper. Fatma believes that art brings people happiness and joy. She often reflects children’s themes in her work, and adds balloons whenever she can. Sara Yaqoub Al Khoori is a 20-year old self-taught Emirati artist and business student in Abu Dhabi. Since early childhood, her passion for art and creativity has grown with every brush stroke. Sara’s talent inspired her to turn it into her career later in life. She works in oil, acrylic, and watercolor and always experiments with new mediums. Sara, who created her first 3D artwork in 2017, constantly works to develop herself and improve her art. Asma Al Khoori started painting at an early age, developing a special bond with art. A graduate in Business Administration from the Higher Colleges of Technologies (HCT), Asma has participated in several art competitions, which helped her enrich herself and hone her talent. Asma considers Dubai Canvas as the ideal opportunity to further refine her artistic skills. She also sees the event as an important addition to Dubai’s creative landscape and a significant source of encouragement and inspiration for young Emirati artists. Mahra Hamdan Al Falahi, is a 20-year old Emirati artist from Abu Dhabi. Currently studying in the College of Fine Arts and Design in the University of Sharjah, Mahra’s works often feature utopian worlds inspired by her childhood. Mahra’s installations aim to give the audience an experience of that world. She has worked with different mediums such as painting, sculpture, printmaking and photography. Currently she’s working with fabric sculpture as part of her senior project. Her work is greatly inspired by her various travels. Myneandyours, an artist resident in the UAE, displays a bold visual language full of colour. His works seem cheerful on the outside, but are laced with dark undertones. He has had no formal artistic training and refuses labels, but has interned with one of the most influential street artists of our time. A group of eight art students from Zayed University will be creating a 3D art piece that highlights different landmarks in the UAE. Students who are part of this group include Fatma Saeed Al Marri, Aisha Yousef Al Sayegh, Amna Mohammed Abdulla, Fatma Obaid Al Shamsi, Hamda Abdulla Al Jassmi, Hamda Al Muhannadi, Suhaila Atiq Al Falasi and Khawla Al Suroor. 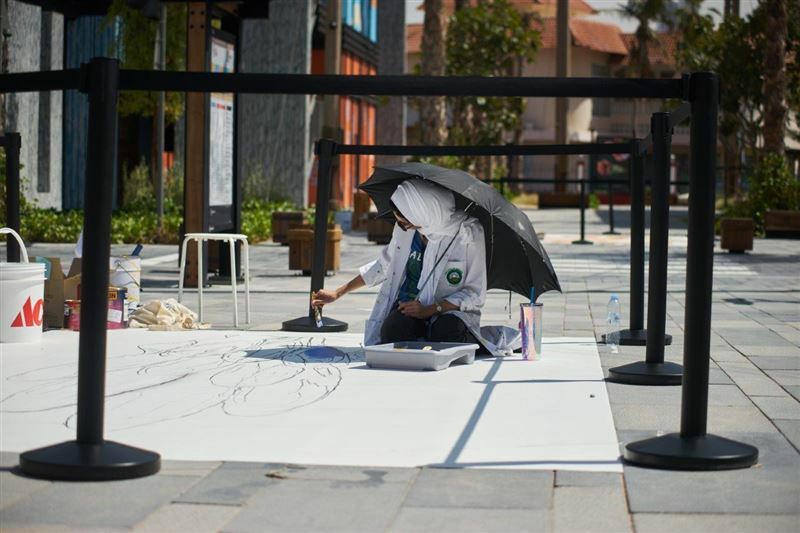 Eight art students from universities across the UAE are shadowing some of the global artists participating in Dubai Canvas, with the objective of observing them at work and learning from their creative techniques. The group includes Shaikha Al Shamsi, Maryam Alghaithi, Fatima Al Katheeri, Alia Abdullah Al Gaoud, Abeer Alburaimi, Shamma Ahmad, Meerah Subaih Al Kaabi and Alia Aqil Karmustaji. Four of the students are working closely with renowned American 3D artist Tracy Lee Stum on a community project. “This will be a great learning experience for the students and will familiarise them with innovative artistic approaches adopted by the world’s best artists,” said Bin Kalli. The fourth edition of Dubai Canvas features over 30 global artists, including the stars of the 3D art world. Apart from 3D art, the event features a range of unique art forms including grafﬁti spaghetti, object art, inflatable art and tape art. In addition to the art exhibition, the family-friendly Dubai Canvas features a number of entertainment activities. Dubai Canvas is free to attend for the public.